Team captain Llewellyn Whittaker led Team South African to a great start on the opening day of the annual 2011 Billabong ISA World Surfing Games which got underway in tricky one metre waves at Playa Venao on the Pacific Ocean coast of Panama on Sunday. Whittaker posted the highest heat tally in the Open Men’s division as all eight team members finished either first or second in their respective opening encounters to advance to Round 2 of the Qualifying stream in the double-elimination format used at the event. Only Australia, Brazil and New Zealand from the 27 countries contesting the event matched SA’s clean sweep on a day when 173 registered surfers in the Open Men, Women and Longboard divisions competed in a full day of action at two surfing venues located 250 metres apart. Whittaker, from Southern Cape, registered scores of 7.17 and an excellent 8.67, both out of 10, for a heat total of 15.84 out 0f 20, leaving his three opponents, including multiple South America champion Magnum Martinez (VEN), needing to improve on both their counting rides to overtake him. The balance of SA’s men’s Open Men’s squad each finished second to Venezuelan opponents in their Round 1 match-ups with Gavin Roberts (SKZN) just four hundredths of a point behind Francisco Bellorin, Matt Bromley (WP) less than half a point short of Rafael Pereira and Klee Strachan (SKZN) just over a point adrift of Justin Mujica. Former World Tour campaigner Nikita Robb (Border) posted the second highest heat tally – 14.67 – of the Open Women’s division to easily win her match-up and progress to Round 2 while teammate Tanika Hoffman (WP) was less than a point behind heat winner Dominic Barona from Ecuador and over four points ahead of the third placed competitor. Team SA’s two longboard surfers, two-time ISA World Champion Matthew Moir and fellow WP competitor Justin Bing, both racked up comprehensive Round 1 victories with Moir’s 15.06 point heat total second only to the 15.66 awarded to Tony Silvagni (AUS) in the longboard division. The 2011 Billabong ISA World Surfing Games runs until Saturday July 2 and all the action will be webcast live at www.billabongisawsg.com starting at 8am (3pm South African time) daily. The 2011 Billabong ISA World Surfing Games were officially opened on Saturday when nearly 275 competitors and officials from the 27 national teams participated in the Parade of Nations through the streets of nearby Pedasi showing their country’s colours and cultural traditions. Thousands of locals lined the streets to welcome the athletes in traditional handcrafted dresses and headdresses adorned with gold jewellery as a sign of joy, celebration, love and respect. As the entire entourage gathered at the stage in the town’s main plaza, the traditional ISA Sands of the World Ceremony began. Representatives from every National Team brought sand from their country’s beaches up to the stage, where they were mixed together in a glass bowl. The perennial ritual signifies the union of nations, beliefs and races through surfing and the Olympic spirit this event embraces. The preparation, training and travel costs for the South African team were made possible by a grant from Sport and Recreation South Africa (SRSA). Skullcandy and Power Balance added their support to the team. Surfing South Africa (SSA) is recognised by the South African Sports Confederation and Olympic Committee (SASCOC), Sport and Recreation South Africa (SRSA) and the International Surfing Association (ISA) as the governing body for the sport in South Africa. The International Surfing Association (ISA) is recognised by the International Olympic Committee and is the governing body for World Surfing. Sarah Baum used her patented forehand attack and full repertoire of progressive manoeuvres to clinch an outstanding third place finish in the ASP 6-Star Swatch Girls Pro France at Hossegor last Friday. The result rocketed the 17 year-old from Warner Beach up to No. 7 on the latest ASP Women’s World Rankings and into contention for a spot on the 2011 ASP Women’s World Title Race. The Top 6 on the World Rankings at the end of each year join the Top 10 from the ASP World Title Race Rankings to contest all the events on following year’s World Title Race, the series of contests that determine the annual ASP Women’s World Champion. With three of the women ranked above Baum already well-placed to re-qualify via their World Title Race Rankings, the SA teenager is in fact currently fourth in line for one of the six qualifying spots with three Star series events still to be run in 2011. Starting the Swatch event in the Round of 48, Baum posted a number of excellent performances including recording the highest scoring ride of Day 2 of the event on Friday – 8.75 out of a possible 10 – and winning a tightly contested quarterfinal over elite tour member Alana Blanchard (HAW). In the semifinals Baum was ousted by eventual runner-up Sage Erikson (USA), pocketing US $2 000 and 2 080 rankings points for third place. The Swatch event was won by current ASP World No. 2 Sally Fitzgibbons (AUS). Other South African girls in the event included Nikita Robb (East London, 19th), Bianca Buitendag (Victoria Bay, 19th), Rosanne Hodge (EL, 25th), Tarryn Chudleigh (Kommetjie, 37th) along with Fay Zoetmulder (Port Elizabeth) and Tanika Hoffman (Kom) who placed equal 49th. The entire SA girls’ contingent has travelled to Portugal for the ASP 6-Star Estoril Surf and Music Billabong Girls 2011 which runs from Friday to Sunday, 10-12 June. The final two events on the 2011 ASP Women’s World Tour rankings, both 6-Star rated, will be run in Spain and on the Azores Islands in September. Bianca Buitendag continued her sensational assault on the World’s age-group surfing scenario by grabbing third spot in the Swatch Girls Pro Junior France on Saturday. The lanky 17 year-old from Victoria Bay in the Southern Cape, who won the Billabong ASP World Junior Championships in Australia in January and finished runner-up in the U18 girls’ division of the Quiksilver ISA World Junior Championships in Peru 10 days ago, again defeated a slew of the world’s best female surfers aged 20-and-under in France. Buitendag earned US $350 after defeat by eventual champion Sarah Mason (NZL) in a semifinal encounter held in tricky one metre waves. Mason went on to beat Demitry Stoyle (AUS) in the final held at Les Bourdaines on the Bay of Biscay coast. South Africans Faye Zoetmulder (PE) and Tanika Hoffman (Kom) finished 25th and 33rd respectively. Royden Bryson produced the best results by the South Africans in the two Prime rated events run in South America over the past fortnight. The Hout Bay based Capetonian boosted his ASP World Tour ranking from No. 113 to No. 81 after placing 13th in the Saquarema Surf Pro International near Rio de Janeiro and following that up with 9th in the Super Surf International in Santa Catarina. Both events were run in huge waves with the final day of the Saquarema event postponed to the Monday when the waves on the Sunday were deemed too dangerous for competition. ASP Dream Tour member Kai Otton (AUS) beat Raoni Monteiro (BRA) to pocket the US$40 000 and 6 500 points there while Brazilian prodigy Gabriel Medina,17, scored two perfect 10 point rides on the final day to claim the title from experienced Australian Tom Whittaker in the Super Surf. Dale Staples (St Francis Bay), who qualifies for all 11 events on the 2011 Prime Series thanks to his third place finish in the 2010 ASP World Junior Title Tour, and fellow 20 year-old, Shaun Joubert (Mossel Bay), who leapfrogged into the top 100 on the rankings with an outstanding fifth place finish in the first Prime event of 2011, were eliminated in the first round (Round of 96) in both events. Brandon Jackson (Durban North) and former ASP Dream Tour campaigner Travis Logie (Durban) only competed in the Super Surf event with Jackson ousted early and Logie, in his first event after recovering from a foot injury sustained in April, advanced to the Round of 48 but placed fourth in his next match-up to end the event 37th overall. Logie has dropped from No. 28 to No. 42 in the rankings but remains the highest placed SA surfer behind Jordy Smith (Durban) who is No. 2 behind 10 times ASP World Champion Kelly Slater (USA). Joubert has maintained his ranking of No. 80 with Bryson now up to No. 81 while Jackson has held on to his No. 104 spot. Beyrick de Vries won the 2-Star rated Quiksilver Pro Junior at New Pier in Durban back in April to take the early lead in the 2011 ASP Africa Pro Junior men’s rankings which determine four of the five-man squad invited to compete in the this year’s ASP World Junior Title series. De Vries, 18, from Umhlanga, produced an impressive display of progressive surfing to overcome Slade Prestwich (Scottburgh), 16, in the final and take home US $2 500 and 500 rankings points. Dylan Lightfoot (Jeffreys Bay) and Michael February (Kommetjie) were sidelined by Prestwich and de Vries in their respective semifinals while Dale Staples (St Francis Bay), David van Zyl (Glenashley), Matt Pallet (Cape Town) and Matt Bromley (Kommetjie) ended their campaigns in the quarters. The ASP Africa Pro Junior men’s rankings will be finalised after the 1-Star Billabong Pro Junior at Victoria Bay in the Southern Cape from September 1-4. The top four on the season ending rankings plus the highest placed ASP Africa Pro Junior on the ASP World Tour Rankings who has not already qualified via the local rankings will join representatives from the other six ASP regions in the World Junior Title series. The 2011 series comprises three events starting with the Oakley ASP World Junior in Bali from October 3-14, followed by the inaugural Arnette ASP World Junior in Rio de Janeiro from October 24-November and culminating in the Billabong ASP World Junior Championships which will be staged as part of the recently announced Australian Open of Surfing at Manly Beach in Sydney from 11-19 February, 2012. South Africa’s traditional mid-year series of international surfing events will be kick-started by the ASP 1-Star Roxy Wahine Girls Pro Junior in Durban followed by the ASP Prime rated Mr Price Pro Ballito at Ballito in KZN and culminates in Jeffreys Bay with the Billabong Pro J-Bay, stop No. 4 of 11 on the 2011 ASP World Title series. The inaugural edition of the Roxy Wahine Pro Junior to be an ASP rated event will be staged at New Pier in Durban on the weekend 18 & 19 June. The event features the country’s best 20-years-and-under female surfers competing for a prize-purse of US $2 000 with the winner also earning one of the two coveted invitations to compete in the 2011 ASP World Junior Title series. The 12th edition of Mr Price Pro Ballito is stop No. 7 of 11 on the ASP Prime Tour and will be run from July 4-10. The event is restricted to the top 88 ranked ASP surfers who enter plus six wildcards and two trialists and offers $250 000 in total prize-money with $40 000 and 6 500 points going to the winner. The field is headed by defending event champion and current World No. 2, Jordy Smith, and includes 24 of the world’s top 34 ranked surfers. The 26th running of the Billabong Pro J-Bay will again attract all of the world’s top 34 ranked surfers to the waves of Supertubes from July 14-24. The event offers a total purse of $425 000 with the winner earning $75 000 and 10 000 points. The seeding is headed by 10-time and reigning ASP World Champion Kelly Slater (USA) along with former world champions Mick Fanning (AUS) and CJ Hobgood (USA), former event champions Jordy Smith (ZAF) and Australians Joel Parkinson and Taj Burrow and current ASP World Title Race ranking s leader Adriano de Souza (BRA). About ASP: The Association of Surfing Professionals (ASP) is the recognized world governing body of professional surfing and has been crowning surfing’s undisputed World Champions since 1976. The ASP sanctions and crowns World Champions for the following tours: the ASP World Tour, the ASP Women’s World Tour, ASP World Junior Tour, ASP World Longboard and Masters Championships. The ASP is dedicated to showcasing the world’s best surfing talent in a variety of progressive formats and has revolutionized the way the world watches surfing via their webcasts and other media platforms. The organization is divided into seven different regions: Africa, Japan, Australasia, Europe, Hawaii, North America, and South America. 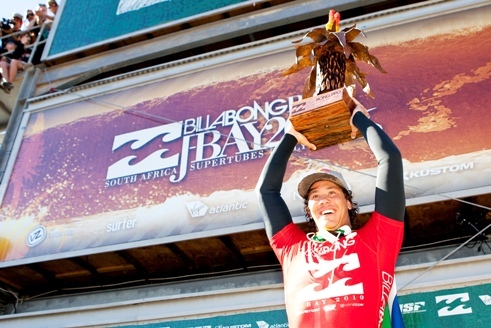 All 32 of the world’s top ranked professional surfers will be in Jeffreys Bay in July for the R3 million Billabong Pro J-Bay 2011, Africa’s only stop on the ASP World Tour, the 11-event series of events that determines surfing’s annual men’s world champion. Scheduled for 14-24 July, the 26th edition of the continent’s most prestigious surfing event will again be staged at Supertubes, the 300 metre stretch of coastline universally acknowledged as one of the planet’s top 10 high performance surf breaks. The stellar field for the 2011 Billabong Pro J-Bay, arguably the most talented group of surfers ever assembled, includes 10-time and reigning ASP world Champion Kelly Slater (USA); South African superstar and defending event champion, Jordy Smith; former two-time world and event champion Mick Fanning (AUS) and previous Billabong Pro J-Bay champions Joel Parkinson and Taj Burrow (both Australians). Throw in the progressive manoeuvres of Dane Reynolds (USA), the precocious talents of Owen Wright (AUS), Michel Bourez (TAH) and 2010 runner-up Adam Melling (AUS), add established stars like current ASP World Tour No. 1 ranked Adriano de Souza (BRA), the Hobgood twins – 2000 world champion CJ and 2009 J-Bay runner-up Damien – along with fellow American Bobby Martinez and spectacular surfing performances are guaranteed to light up the waves at Supers. The 36 man field also includes South Africa’s ‘uber-wildcard’ Sean Holmes (Cape Town), conqueror of both Slater and the late Andy Irons (HAW) on his way to fifth place last year. Holmes’ uncanny affinity with the waves at Supertubes has wrecked the title hopes of so many of the top contenders over the years. The second wildcard goes to the winner of the VonZipper Superheat, a five-man encounter held on the first day of the event featuring South African rising stars Shaun Joubert (Mossel Bay) and Dale Staples (St Francis Bay); international contenders Granger Larson (HAW) and reigning ASP World Junior Champion Jack Freestone (AUS) along with Shaun Payne (St Francis Bay), winner of the Xcel Pro Showdown at Supers. This year sees three days of major underground music talent coinciding with the world-class surfing action. The Billabong Pro Music Festival runs Friday to Sunday, 15 to 17 July, at the Jolly Dolphin featuring a lineup of 14 top SA bands including the likes of Aking, City Bowl Mizers, P.H.Fat, Jack Parow and the ever-popular local Hot Wasabi band fronted by the legendary Steve Walsh. Billabong continues its efforts to heighten awareness of local and global surf communities to the challenge of climate change, and how we all need to become part of the solution, by making the 2011 Billabong Pro J-Bay a ‘greener event’. Building on the programs instituted over the past two years, the estimated 384.5 tonnes of CO2 emissions generated by the event activities, including the travel by local and international participants and officials, will be reduced wherever possible. The remaining emissions will be offset using United Nations Kyoto compliant carbon credits ensuring a low carbon, climate-conscious event and that the barrels ridden at Supers are green in more ways than one. The eyes of the surfing world will be firmly fixed on Jeffreys Bay from 14-24 July as hundreds of thousands of surf fans worldwide log millions of page impressions while following the fortunes of their favourite surfers. All the action will be covered via webcasts on www.billbabongpro.com featuring live scoring, expert commentary and interviews, video footage with multiple camera angles, slow-motion replays, video on demand highlights of previous heats and online competitions with valuable prizes. The optimum experience remains attending the event and there is nothing quite like watching the action live from the natural amphitheatre on the dunes overlooking the liquid runway known as Supertubes, mingling with the world’s best surfers and enjoying the legendary party atmosphere in J-Bay throughout the 11-day event. Be there. The Billabong Pro J-Bay 2011 is proudly presented by South Africa’s adventure province Eastern Cape Parks and Tourism Agency and further supported by Carling Black Label, Monster Energy, Coca Cola, Amarok, Vida e Caffe, Tavcor, VonZipper and Nixon.